Orion has introduced the new 10″ and 12” f/8 Truss Tube Ritchey-Chrétien Astrographs. Each telescope features premium quartz mirror optics in its hyperbolic primary and secondary to achieve flat images that are virtually free of chromatic aberration, for true-color performance. The primary mirror and the secondary mirror are figured from low-expansion quartz glass and offer enhanced aluminum coatings to provide 96% reflectivity. The primary mirror is fixed in place to eliminate the “image shift” that can plague Schmidt- and Maksutov-Cassegrain telescopes. The secondary mirror is precisely center-marked to facilitate collimation. 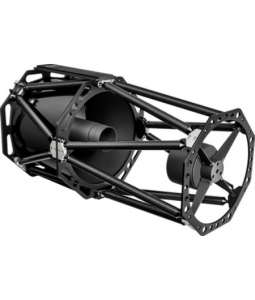 The telescopes’ Serrurier carbon fiber truss system is thermally very stable, minimizing the effect of ambient temperature changes on the telescope’s focus. The Serrurier system utilizes two sets of opposing truss tubes on either side of the declination pivot plane, which keep the optical elements parallel to each other no matter how the telescope is oriented, thus keeping optical collimation precisely intact. Stainless steel ball and socket hardware connects the truss tubes to the telescope’s three large CNC-machined aluminum support plates. The focuser included with the telescopes is a CNC-machined 3.3″ dual-speed (10:1) linear bearing Crayford focuser that features a stainless-steel rail on the drawtube that provides extra support for up to 9 lbs. of imaging gear without flexure or slippage. The focuser can be rotated 360 degrees for image framing. Both 2″ and 1.25″ non-marring compression ring accessory collars permit the use of 2″ or 1.25″ accessories. The tube assembly is equipped with a D-style dovetail mounting bar on both the bottom and top. A dovetail finder scope base is also installed for attachment of any Orion finder scope or reflex sight (sold separately). Three 1.5″ 12V DC cooling fans are mounted on the rear cell to help accelerate optical equilibration to ambient temperature. A battery holder is included (requires eight user-supplied AA batteries), as are one 2″ and two 1″ threaded extension rings for use in reaching focus with various configurations of imaging cameras and accessories. Primary and secondary mirror dust covers are also provided. The 10” version weighs 35 lbs without any additional accessories and requires an equatorial mount that can support that load, such as the Orion Atlas Pro AZ/EQ-G or HDX110 EQ-G. Weighing in at 52 lbs, the 12” version requires an equatorial mount that can support that load, such as the Orion HDX110 EQ-G equatorial mount. The 10” version is retail priced at $2,999.99US and the 12” version is retail priced at $4,299.99US.